Dussing, Michael (translator), Aeronaut, 2019, new (soft cover),August Euler was an important German aviation pioneer; he gained German pilot’s license No.1, designed and built airplanes, was a flight instructor, & created a flight school. After WWI he served as Germany’s Secretary of State for aviation. The book is published in two volumes totaling 440 pages with 396 photos & 136 drawings plus 1/48 scale drawings of six Euler aircraft. Volume 1 has 206 pages, 235 photos, 32 graphics & scale drawings of 2 aircraft. Volume 2 has 234 pages, 161 photos,136 graphics & scale drawings of 4 aircraft. Bronnenkant, Lance, Aeronaut, 2018, new (hard cover), limited edition to 400 copies, This is the complete story of Oswald Boelcke, one of the greatest pioneers of fighter aviation & the man Manfred von Richthofen, the “Red Baron,” called his hero. This definitive biography – lavishly illustrated with over 650 photos – provides a wealth of new information on this remarkable young man, including some of his original letters & accounts by people who knew him. After his tragic death in a mid-air collision with one of his closest colleagues, his teachings and the memory of his inspirational personality and leadership continued to influence fighter aviation up to the present day, 856 pages. Schmeelke, Michael, Aeronaut, 2018, new (hard cover), limited edition to 400 copies, Facing the Thames Estuary across the English Channel, the German naval aviators of Flandern I, later See I, fought a determined war against British air & sea forces throughout WWI. Zeebrugge, the anchor of the seaward extension of the Western Front into the English Channel & North Sea, was the most important German naval air station of the Great War. This book, written by a German historian and translated into English, tells the story of its men and machines, 333 photographs & illustrations, 47 color profiles, 328 pages. Schmaling & Bock, Aeronaut, 2018, new (hard cover), limited edition to 400 copies, Royal Prussian Jagdstaffel 23 is the second book in the milestone series on WWI German fighter units, their pilots & colors and markings of their aircraft 341 photos, hundreds of them previously unpublished & color profiles of 68 aircraft, 17 maps showing the location of every victory & loss. The cover painting by noted artist Russ Smith was commissioned especially for this book. 368 pages. Owers, Colin, Aeronaut, 2018, new (soft cover), discuss and illustrate the world’s first all-metal airplanes, including the development of their all-metal structural technology as well as the aircraft themselves. Numerous photographs and contemporary drawings are included, 356 photographs, including 82 in color& color profiles of 13 aircraft, 208 pgs. Owers, Colin, Aeronaut, 2018, new (soft cover), discuss and illustrate the world’s first all-metal airplanes, including the development of their all-metal structural technology as well as the aircraft themselves. Numerous photographs and contemporary drawings are included, 229 photographs, including 30 in color, and color profiles of 14 aircraft. It also includes 7 color images illustrating factory colors and markings, 192 pgs. Wilberg, James, Aeronaut, 2018, new (soft cover), Gottfried von Banfield, his biography, the leading Austro-Hungarian naval ace of the Great War & the last surviving holder of the Order of Maria Theresa of the Austro-Hungarian Empire, 260 photos, 16 in color, 15 color profiles, + 33 color paintings and postcards, 222 pgs. Wilberg, James, Aeronaut, 2018, new (soft cover), supplements the biography Gottfried von Banfield, with additional information about the air war over the Adriatic that covers specific people, events, & aircraft in detail, 229 photos, 20 in color, 50 color profiles + 24 color paintings and graphics. In addition, scale aircraft drawings of 12 different Austro-Hungarian naval aircraft are included, 196 pgs. Herris, Jack, Aeronaut, 2017, new (soft cover), describes & illustrates the development of DFW aircraft of WWI with text, 430 photos, 23 in color, 45 color profiles + 11 pages of factory colors, production quantities & serial numbers, dimensions and performance specifications, 1/48 scale drawings, 286 pgs. Bowden, Matt, Aeronaut, 2017, new (soft cover), details the results of many individual reconnaissance flights & the specific command decisions based on their observations. Volume 1 contains 35 maps in color, 165 photos and postcards, 72 of them in color, & several color profiles of 1914 German reconnaissance airplanes 378 pgs. 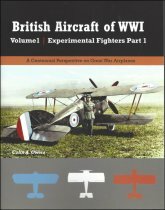 Owers, Colin, Aeronaut, 2017, new (soft cover), British experimental fighters Part 1, documents 9 interesting British experimental fighters in detail , photos, scale drawings, and color profiles. The aircraft covered are the Austin Osprey, Boulton & Paul Bobolink, Nieuport B.N.1, Sopwith Snipe, Vickers F.B.16 series, Bristol M.R.1, Westland N.1B, and Westland Weasel, 133 photographs, 33 color profiles, 12 color top views, and scale drawings of 9 aircraft types, 154 pgs. Herris, Jack, Aeronaut, 2016, new (soft cover), development of early Albatros two-seaters of WWI through the C.IV with text, production quantities and serial numbers of aircraft includes aircraft dimensions and performance specifications, 444 photos, 56 color profiles, 230 pgs. 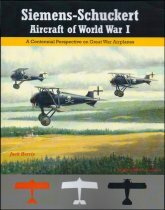 Herris, Jack, Aeronaut, 2017, new (soft cover), describes & illustrates the development of later Albatros two-seaters of WWI, production quantities & serial numbers of aircraft, includes aircraft dimensions, performance specifications. Five aircraft are illustrated in scale drawings to 1/48 scale, 359 photos, 48 color profiles, 212 pgs. 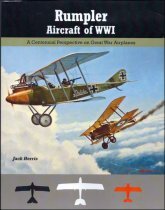 Herris, Jack, Aeronaut, 2017, new (soft cover), describes & illustrates the development of Albatros bombers, seaplanes, and J-Types, of WWI, 188 photos, scale drawings, 34 color profiles, production quantities & serial numbers of aircraft, aircraft dimensions,d performance specifications, 142 pgs. 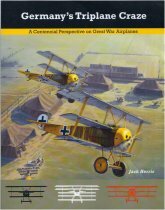 Herris, Jack, Aeronaut, 2017, new (soft cover), describes & illustrates the development of Albatros fighters of WWI, production quantities, serial numbers of aircraft, aircraft dimensions & performance specifications, 10 aircraft are illustrated in 1/48 scale drawings , 316 photos, 125 color profiles, 22 color plan views, 224 pgs. Owers, Colin, Aeronaut, 2016, new (soft cover), signed by author, describes & illustrates the development of the America and Felixstowe flying boats of WWI with text, 745 photos and drawings, color profiles,aircraft production & technical specifications. An overview of their operational use is included. 355 photos & drawings, 27 color profiles, a color cutaway drawing of the H-16, scale drawings of the F.1 and F.3. 272 pgs. Owers, Colin, Aeronaut, 2016, new (soft cover), signed by author, describes & illustrates the development of the America and Felixstowe flying boats of WWI with text, 745 photos and drawings, color profiles,aircraft production & technical specifications. An overview of their operational use is included. 390 photos & drawings, 39 color profiles, 280 pgs. 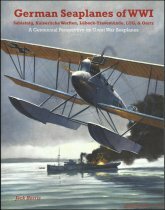 Revell, Alex, Aeronaut, 2016, new (soft cover), story of the 19 British pilots who were awarded Britain’s highest award for valour for their heroic actions during WWI. 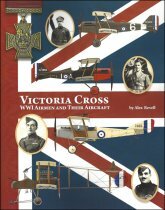 These biographies are illustrated with 144 photos & 42 color profiles of aircraft flown by these men, including of all the aircraft flown in the Victoria Cross actions, 156 pgs. 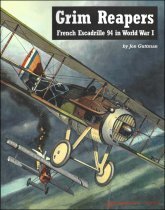 Guttman, Jon, Aeronaut, 2016, new (soft cover), describes & illustrates the combat history of French Escadrille 94 in WWI with text, 105 photos (8 in color) & 16 color profiles, 94 pgs. 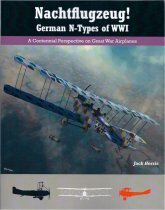 Herris, Jack, Aeronaut, 2016, new (soft cover), book describes & illustrates the development of Friedrichshafen aircraft of WWI with text, 541 photos, 18 in color, 37 color profiles, production quantities, serial numbers of aircraft, aircraft dimensions & performance specifications. There are 26 official SVK drawings & 11 aircraft are illustrated in scale drawings to 1/48 (4) or 1/72 (7) scales, 312 pgs. 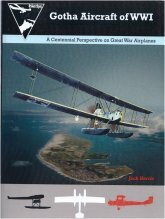 Herris, Jack, Aeronaut, 2016, new (soft cover), story of the origin & development of fighter aviation during World War I, the first air war, the legend of the fighter ace. 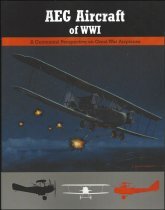 The story combines the exploits of the aces, the evolution of combat tactics, & technical development of fighter aircraft from its primitive beginnings to the armistice, presaging the aerial arms race that continues today, when the fighter is the key offensive aerial weapon, 550 photos (36 in color), 170 color profiles, 280 pgs. 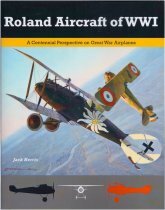 Owers, Colin, Aeronaut Publisher, 2015, new (soft cover), the development of Brandenburg land warplanes in WWI with text, 475 photos (59 in color), 67 color profiles, 9 factory 3-view drawings & 10 detail drawings, production quantities & serial numbers of aircraft, dimensions & performance specifications. In addition, 6 Brandenburg land warplanes are illustrated in 1/72 scale drawings. 230 pgs. Owers, Colin, Aeronaut Publisher, 2015, new (soft cover), s the development of Brandenburg biplane seaplanes in WWI with text, 336 photos, 54 color profiles, 13 factory 3-view drawings & 28 SVK drawings, production quantities and serial numbers of aircraft, dimensions & performance specifications,15 Brandenburg biplane seaplanes are illustrated in 1/72 scale (6) or 1/48 scale (9) drawings, 276 pgs. 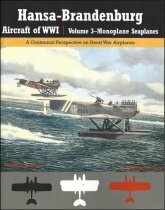 Owers, Colin, Aeronaut Publisher, 2015, new (soft cover), development of Brandenburg monoplane seaplanes in WWI with text, 460 photos (21 in color), 38 color profiles, 7 factory & SVK 3-view drawings, production quantities, serial numbers, dimensions, performance. 1/48 scale drawings & a large photo addendum provides additional photo coverage of Brandenburg landplanes & biplane seaplanes, 248 pgs. Casari, Robert, Aeronaut, 2014, new (oversized, issued with pictorial cover, More than 1,000 photos & drawings, 38 color profiles. Covers all American military aircraft produced domestically or purchased from France, Britain, and Italy, 752 pgs. BELGIAN AIR SERVICE IN THE FIRST WORLD WAR Pieters, Walter, Aeronaut, 2010, new (issued w/o dj), oversized, the story of the men, machines & operations of Aviation Militaire Belge from its beginnings until the Armistice, airplanes of the Belgian Air Service, daily chronology, biographies of 375 Belgian aviators, over 1,000 photographs, 81 color profiles, example of color profiles, 728 pgs. 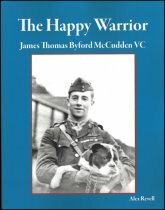 Revell, Alex, Aeronaut, 2015, new (soft cover), James McCudden became one of the leading British aces of WW I, his biography with 275 photographs, 304 pgs. 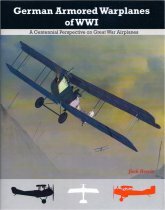 Herris, Jack, Aeronaut, 2015, new (soft cover), describes & illustrates the development of AEG aircraft in WWI, 277 photos, 70 color profiles, production quantities & serial numbers of aircraft, dimensions & performance specifications, 8 AEG aircraft types are illustrated in either 1/72 (2 aircraft) or 1/48 (6 aircraft) scale drawings. 186 pgs. Herris, Jack, Aeronaut, 2014, new (soft cover), 160 photos, 34 color profiles, scale drawings of 7 aircraft in 1/48 scale, 90 pgs. Bronnenkant, Lance, Aeronaut, 2012, new (soft cover), covers Oswald Boelcke & Max Immelmann, the first two aviation recipients of the Pour le Mérite & among the best known and most significant, 155 period photographs & 7 color profiles of aircraft flown by Boelcke and Immelmann, 112 pgs. Bronnenkant, Lance, Aeronaut, 2012, new (soft cover), covers Hans-Joachim Buddecke, Kurt Wintgens & Max Ritter von Mulzer, the third through fifth aviation recipients of the Pour le Mérite. Buddecke spent much of his career in Turkey, the other two aces have received modest coverage until now. 168 period photographs & 10 color profiles of aircraft flown by these aces, 112 pgs. 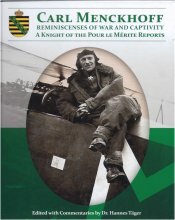 Bronnenkant, Lance, Aeronaut, 2013, new (soft cover), German airmen awarded the Pour le Merite, comprehensive biography of each man, photos of the aircraft they flew, color profiles, 118 pgs. 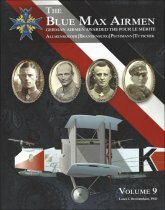 Bronnenkant, Lance, Aeronaut, 2014, new (soft cover), Volume 5 covers Manfred von Richthofen, the famous Red Baron, the highest scoring and most famous ace of the Great War and one of the earliest recipients of the Pour le Mérite. This volume includes 130 period photographs, 13 color photos & illustrations, 30 color profiles of aircraft flown by Manfred von Richthofen, 136 pgs. Bronnenkant, Lance, Aeronaut, 2015, new (soft cover), German airmen awarded thePourle Merite during WW I, covers Ernst von Hoeppner, Hermann Thomssen & Werner Voss, 137 photographs, 9 in color & 16 color profiles of aircraft flown, 108 pgs. 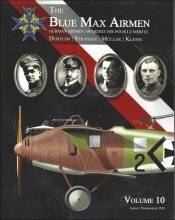 Bronnenkant, Lance, Aeronaut Publisher, 2015, new (soft cover) covers three fighter aces, Otto Bernert, Emil Schaefer, and Kurt Wolff. Volume 7 includes 133 photographs, 4 of them in color, and 12 color profiles of aircraft flown by these men in its 118 pages. Bronnenkant, Lance, Aeronaut, 2017, new, soft cover, covers 2 fighter aces, Carl Allmenroder & Adolf Ritter von Tutschek, bomber commander Ernst Brandenburg & observer Paul von Pechmann, 182 photographs & 11 color profiles, 142 pgs. Bronnenkant, Lance, Aeronaut, 2018, new (doft cover), covers two fighter aces, Eduard Ritter von Dostler & Max Ritter von Müller, bomber commander Rudolf Kleine, & Leader of Airships Peter Strasser, includes 128 photographs, 10 of them in color, & 7 color profiles of aircraft flown by these men, 114 pgs. Bronnenkant, Lance, Aeronaut, 2018, new (soft cover) Walter von Bülow-Bothkamp, Curt Wüsthoff, & Erwin Böhme, includes 136 photographs, 3 of them in color,10 color profiles of aircraft flown by these men, 122 pages. Tager, Hannes (Editor), Aeronaut, 2013, new (pictorial cover), one of Germany’s great aces of WWI, who scored 39 victories & was awarded the Pour le Mérite. Continues until today with the touching story of two families, the Menckhoffs & the Averys, uniting years after Menckhoff’s last combat when he was downed by fledgling American pilot Walter L. Avery of the 95th Aero Squadron. 208 photos, 14 in color, 9 illustrations, maps, color profiles. 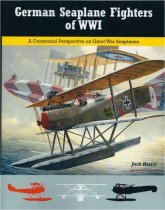 Herris, Jack, Aeronaut, 2012, new (soft cover), origins, development & evolution of each warplane class or category, such as fighters, bombers & reconnaissance planes. Aero engines are also included, photos, color profiles, 148 pgs. Herris, Jack, Aeronaut, 2012, new (soft cover), describes development, 160 photos, 38 color profiles, tables of information, production quantities & serial numbers, 116 pgs. Herris, Jack, Aeronaut, 2015, new (soft cover), development of seaplanes built by Sablatnig, Kaiserliche, Werften, Lubeck-Travemunde, LTG & Oertz with test, 110 photos, 19 color profiles, production quanties & serial numbers, scale drawings, 114 pgs. Herris, Jack, Aeronaut, 2012, new (soft cover), production quantities & serial numbers of aircraft with technical specifications. Origins & evolution of each subclass of naval fighter, including single-seat floatplanes, single-seat flying boats, two-seat biplanes & two-seat monoplanes, photos, color profiles, scale drawings, 150 pgs. Herris, Jack, Aeronaut, 2014, new (soft cover), 310 photos, 50 color profiles, scale drawings of 4 fighter aircraft in 1/48 scale, 152 pgs. Herris, Jack, Aeronaut, 2014, soft cover, 329 photos, 54 color profiles, production quantities & serial numbers of aircraft, and aircraft dimensions and performance specifications. In addition, four G-type bombers, the Albatros G.III & Rumpler G.I, G.II, and G.III are illustrated in 1/72 scale drawings, 202 pgs. Herris, Jack, Aeronaut, 2013, new (soft cover), three fighter competitions with over 215 photos illustrating 70 fighter designs, 68 color profiles + performance specifications, 166 pgs. Herris, Jack, Aeronaut, 2013, new (soft cover), 345 photos, 8 color photos, 44 color profiles, performance, specifications & production data, scale drawings 102 pgs. Herris, Jack, Aeronaut, 2013, new (soft cover), describes & illustrates the development of Gotha warplanes with more than 285 photos, 28 color profiles, performance, specifications & production data, scale drawings, 198 pgs. Herris, Jack, Aeronaut, 2012, new (soft cover), production quantities, serial numbers of aircraft, technical specifications, 1/48 scale drawings of the AEG N.I & Sablatnig N.I, and 1/72 scale drawings of the BFW N.I.Photos & color plates, 44 pgs. Herris, Jack, Aeronaut, 2012, new (soft cover), many photos, scale drawings, color plates see example, , expanded from 180 pgs. to 264 pgs. Herris, Jack, Aeronaut, 2014, new (soft cover), aircraft designed & built by L.F.G. roland, 390 photos (b&w + 9 in color), 50 color profiles, line drawings (1/48 scale), 206 pgs. Herris, Jack, Aeronaut, 2014, new (soft cover), 370 photos, 53 color profiles, production quantities and serial numbers of aircraft, and aircraft dimensions and performance specifications, 208 pgs. 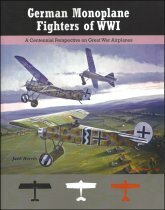 Schmaling & Bock, Aeronaut, 2014, new (pictorial cover), this is the first time German authors have written a book translated into English about WW1 German fighter pilots, anecdotes & photos showing the personality of these young warriors in addition to the detailed discussion of their combats. Maps and original documents are included, along with the flight log of one of the acting commanding officers. Extensive excerpts of the Jasta 30 war diary are included along with a list of pilots who served with the unit, a list of aircraft by type & serial number that served with Jasta 30, 208 pgs. Herris, Jack, Aeronaut, 2014, new (soft cover), describes & illustrates the development of Siemens-Schuckert aircraft in WWI with text, 305 photos, 49 color profiles, production quantities & serial numbers of aircraft, aircraft dimensions & performance specifications. In addition, eight SSW aircraft types and one guided missile are illustrated in either 1/72 (1 aircraft) or 1/48 (7 aircraft & the missile) scale drawings, 208 pgs.